The Marianas March Against Cancer is almost here!! It will be taking place on May 22-23, 2009 at the Hopwood Jr. High School Field. During this event, we will be burning luminary candles to support and honor our family and friends who are either battling this deadly disease or have passed away as a result of their battle. 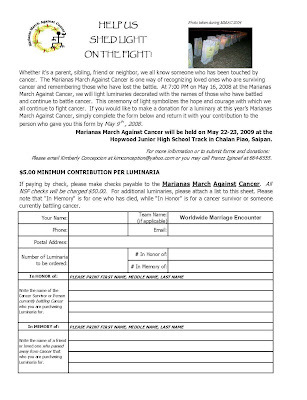 If you would like to order a luminary for someone in your life who has been affected by cancer, please fill out the form below and give us their information. Luminaries are $5 each. Please email back any completed forms or call our TEAM WWME Captains, Antonio Lorraine Arriola for more details at 898-5787 (c), 237-3350 (Lorraine's Work), 288-0462 (h). We hope to see you at the MMAC this year!